Dennis McDaniel, a recent M.Div. 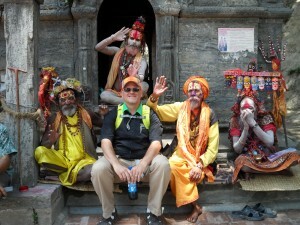 graudate from Southern Seminary, sits with four Hindu holy men on the steps of the Pashupatinath Temple in Kathmandu, Nepal. Smoke rolled to the heavens as the bodies of devout Hindus burned upon pyres in a religious ceremony at one of the largest Hindu temples in the world. Family members circled their loved ones and stoked the flames before shoving the ashes off the riverbank into the Bagmati. Across the street from the Pashupatinath Temple in Kathmandu, Nepal, six students from The Southern Baptist Theological Seminary witnessed a religious ritual they believed reflected a “sobering” spiritual reality. “I felt so brokenhearted for these people who have no hope after watching them burn the bodies of eight people who recently died, probably mirroring what they were experiencing in hell,” said Dennis McDaniel, a student member of the mission team that traveled to South Asia this summer. Compelled by the display of hopelessness, McDaniel approached four holy men on the steps of the ancient Hindu temple to establish a connection that transcended cultures. McDaniel, of Corydon, Indiana, was one of 45 students who served on short-term trips with the Bevin Center for Missions Mobilization at Southern Seminary, which cultivates evangelism, missions and church planting across the world. Seven faculty-led teams comprised of Southern Seminary and Boyce College students spent two weeks on four different continents to reinforce the gospel work of alumni serving overseas. “Our desire is to serve the churches that are in these different areas, to go and undergird the work that our alumni are doing in various places around the world and support their long-term vision for making the gospel go forth in those areas,” said Garrett Milner, student life director at Southern Seminary and member of the South Asia team. 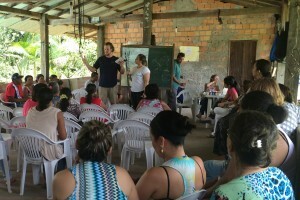 Boyce College student and basketball player Brantley Beck preaches at the community center of Menino Jesus in Brazil. In the trips, spread across May and June, students served in Brazil; Central Asia; South Asia; France; the Himalayas; Baltimore, Maryland; and Salt Lake City, Utah. Michael Wellman, student missions coordinator and intern for the Brazil team, said short-term mission trips are most effective when the students are well-trained beforehand to invest in the missionary’s long-term work. The Brazil team visited three different regions within the country, each with its own distinct needs. This required a thoughtful and varied approach. While some Christians are called to go overseas, and others are called to support and send them, Stitzinger said that every young Christian would benefit from a short-term mission trip. At Southern Seminary and Boyce College, students are encouraged not simply to study missions in the abstract, but also to participate in the spread of the gospel themselves. The Bevin Center hopes to teach students by placing them on the front lines of global evangelism. After seeing the global need for the gospel, the students describe a renewed eagerness to work for the fulfillment of the Great Commission. Timur Nesbitt, the student intern on the Central Asia trip and Boyce student, encouraged his teammates to maintain mission fervor after returning to the United States, even by engaging in opportunities in their own contexts here in Louisville. Founded in 2012, the Bevin Center provides an outlet for students to engage in missions, cultivating international awareness and providing numerous opportunities to serve overseas. For more information on the Bevin Center mission trips, go to missions.sbts.edu.